The Woodlands Grass-Roots Environmental Education Network is a local 501(c)3 volunteer non-profit that promotes natural resource conservation, recycling, solid waste reduction, safe and sensible care of air and water resources, and other responsible actions that protect the environment and its inhabitants. 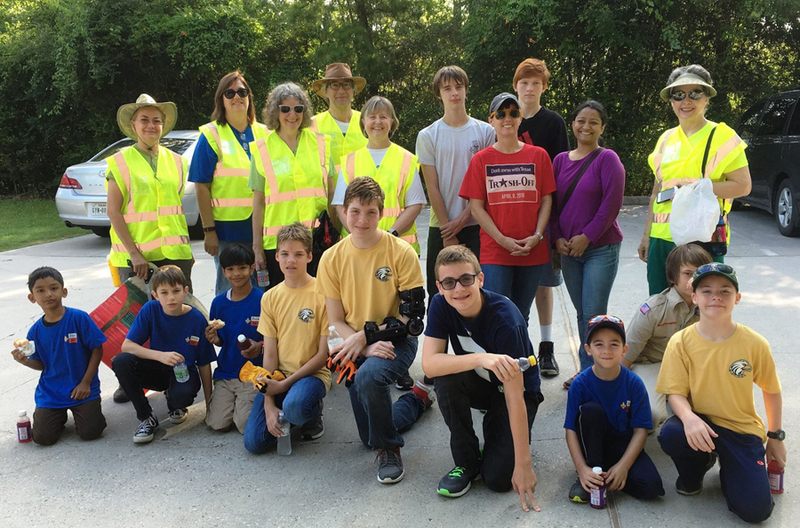 Founded in 1989 as “The Woodlands Recycles”, the group is celebrating its 30-year history and welcomes residents to learn more at its annual meeting on June 4. At this meeting The Woodlands GREEN will recap the year’s activities and award checks to scholarship winners, the libraries, and village associations. Additionally, three members will be elected to the Board of Directors. The meeting is open to the public and will be held at the Parks and Recreation Department Environmental Services Department, 8203 Millennium Forest Drive. Curbside recycling might seem ordinary today, but it wasn’t long ago that the vast majority of households in the U.S. sent 100 percent of their waste to landfills. The group’s first initiative began with periodic recycling drives at local collection points, and Feed the Dragon competitive recycling drives to get children and families involved. By 1994 community governance (at that time it was the Woodlands Community Association, WCA) had taken over the hugely popular program, and curbside pickup for recycling of paper, glass, aluminum, and many plastics had been established for households throughout The Woodlands. Though curbside recycling is now a Township program, The Woodlands GREEN continues to emphasize recycling by co-sponsoring the “Village Challenge” and awarding checks to the village that collects the most of the targeted recyclable (for 2018: CDs, DVDs, and CD/DVD jewel boxes). Village Challenge recyclables are collected and tallied at the Township’s 3R Bazaar every November. Co-sponsors of the Village Challenge include The Woodlands Development Company, HEB, and the Woodlands Joint Powers Agency. The Woodlands GREEN has a legacy of partnering with The Woodlands Township. Though it began with recycling, the two entities now work together to promote numerous sustainability related educational initiatives. This partnership is a reflection of the history and vision of The Woodlands, and the desire of Woodlands founder George P. Mitchell to obtain a better balance between urban development and the natural environment. Many residents choose The Woodlands because of this balance of natural beauty, sensible development, and cultural amenities. The educational programs and activities offered by The Woodlands GREEN give residents a way to get involved and support positive environmental and sustainability actions around the community. Programs of The Woodlands GREEN are funded by modest membership fees, donations, rain barrel sales, and the group’s major fundraiser, the Buy Recycled Boutique. Rain barrel sales include a rebate for township residents within Montgomery County, while the Boutique is a unique market for products made with recycled materials: toys, holiday-themed gifts, jewelry, hand-made crafts, and items for the yard and garden. Over the past 13 years, The Woodlands GREEN has awarded 40 scholarships to high-school seniors who exemplify a commitment to preserving the environment and who plan to continue their education or vocational training. This spring, the scholarship committee received so many outstanding applicants that the number of awards was increased from three to four. Come to our annual meeting on June 4 to hear about this year’s inspiring students. Each will receive $1000 toward their higher education. The Student Ambassador Program provides students with community service opportunities with The Woodlands GREEN and affiliated partners. Student Ambassadors in grades 9-12 assist with recycling events, village tree plantings, Earth Day Green Up, and other activities sponsored by The Woodlands GREEN. Students participating in the Ambassadors program are encouraged to apply for Woodlands GREEN scholarships in their senior year. The Student Ambassador program has seen tremendous growth, with 27 students currently participating. Activities for 2018 include helping at the Waterway Arts Festival, cultivating a community garden at Bear Branch Park, kayaking cleanup on Lake Woodlands, and a crafts workshop to make useful items out of used corks. These free lectures are about various aspects of sustainability, clean energy, clean air, clean water, and related issues. Recent lecture topics have included “Climate Change: What Does the Future Hold for our Community”, “Water Smart Landscaping with Native Plants”, “Soil: Your Ultimate Water Reservoir”, “The Quiet Invasion (Invasive Species)”, “The Air We Breathe (Regional Air Quality)”, “Solar Energy: What’s Next in Developing Community Energy Projects?”, “Energy Efficiency for the Home and Environment”, “Bicycling in The Woodlands”, and “The Galveston Bay Report Card”. Going GREEN Lectures are held at the LEED Platinum facilities of the Houston Advanced Research Center (HARC), 8801 Gosling Road. Sponsored by The Woodlands Township Environmental Services Department and supported by The Woodlands GREEN and Nature’s Way Resources, this free series spotlights nature in our own backyard, celebrating the rich habitat and wealth of wildlife species found in Southeast Texas. Guest speakers who are experts in their field reveal the beauty, natural history, habits and interactions of plants, insects, birds, mammals and other animals. The lecture series runs February thru April, and September through November. These events are often held at outdoor venues in The Woodlands. Recent topics have included “Falconry”, “Snakes and More”, “Big Cats of Texas”, and “Wild Dining: Foraging the Forest”. The Dragon Circle bi-annual newsletter provides tips for green-living, updates on local environmental issues, reports of recent activities, and news of upcoming events. Download the latest issue HERE. Did you know the dragon sculpture in Lake Woodlands inspired the logo of The Woodlands GREEN? Residents may know that Cynthia Woods Mitchell was a strong advocate for the arts. Though there are many public sculptures throughout The Woodlands, the dragon in Lake Woodlands was the only piece purchased personally by Mrs. Mitchell. The dragon was presented as a gift to the community and installed in the lake at Northshore Park in 1985.